2004-2005 Toyota Prius have a flaw in their wiper cowl; specifically how it seals water from breaching the engine compartment. The result is a small but significant trickle onto the top of the engine, right where the ignition system sits in a ready-made canal for water storage. 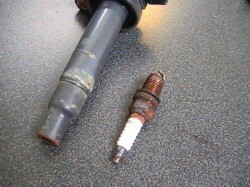 As water sits for an unknown length of time (the plugs are not due for service for 100k miles), the metal rusts and corrodes, making a nasty mess of the spark plug itself and the coil that perches above it. The problem is otherwise invisible since the plugs and coils are mounted into tubes through the top of the head and any residual water evaporates with the heat of the engine. In this case, the cylinder that still held water (#1) began to misfire only after extended highway driving (roughly 10 continuous minutes); there were no symptoms in the city or short trips, basically anytime the engine stayed cool. Once it did act up, the condition amplified until it was present for all conditions (light or heavy throttle, low or high speeds). The sensation was a kind of rubber-band power, unlike conventional cars where the engine connects directly to the wheels. The “check engine” light flashed, indicating a catalyst damaging misfire. The vehicle did not store hard codes, only a pending one for cylinder #1 (P0301 Misfire Detected, Cylinder #1). Toyota identifies this problem in a Technical Service Bulletin (TSB EG063-05) and recommends replacing any damaged plugs and coils and updating the seal on the cowl. 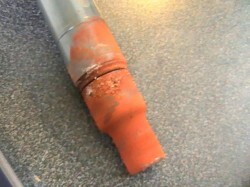 The repair is covered under warranty for three years or 36,000 miles. 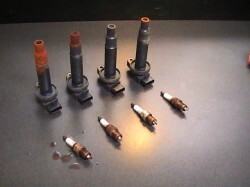 Otherwise the fix costs $150 per plug and coil and another $150 to reseal the cowl.